One of important asset class for portfolio diversification is small cap growth. 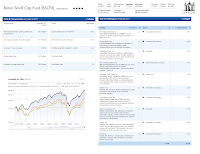 Barron Small Cap fund has been among the best fund in this class over the long term period. The fund has provided a slow and consistent approach to small cap investing. Cliff Greenberg has been the manager since its inception in 1997. This fund is also featured in Kiplinger’s 25 Best Mutual fund list. Most of the small cap fund can provide additional performance boost in your portfolio diversification, though higher return also meant higher risk. Baron Small Cap fund is looking for capital appreciation. At least 80% of its net assets are invested in equity securities. The investment is in the form of common stock of small-sized growth companies. These companies must have less than $2.5 billion of market capitalization measured at the time of purchase. This fund seeks to as well buy the securities that are expected to have a 50% value increase within two years judged by BAMCO Inc.
Baron Small Cap fund requires a minimum of $2,000 to invest in its brokerage and IRA account. For any subsequent investment, investor can invest accordingly hence there is no minimum subsequent investment. The 12b1 fee is 0.25%. There is neither front end sales load nor deferred sales load. The expense ratio of this fund is 1.31% yearly. Morningstar has rated this fund with 4 stars rating. You can purchased this small growth stock fund from a wide range of 110 brokerages include T. Rowe Price, Merrill Lynch, JP Morgan, TD Ameritrade, CommonWealth, Fidelity Retail Funds Network, etc. The other class of this fund is Baron Small Cap Fund Institutional (BSFIX). This fund may have lower annual expense ratio than retail shares. The top 10 fund holdings include Penn National Gaming Inc (Consumer Discretionary), TransDigm Group Inc (Industrials), Liberty Media Corp (Consumer Discretionary), SBA Communications Corp (Telecommunication Services), Brookdale Senior Living Inc (Health Care), Gartner Inc (Information Technology), Waste Connections Inc (Industrials), Mettler-Toledo International Inc (Health Care), Fossil Inc (Consumer Discretionary), and Clean Harbors Inc (Industrials) as of March 31, 2011. These ten companies in this Baron fund make up to 23.2% of total net assets. The sector breakdown consists of 11 sectors, dominated by 22.9% of Consumer Discretionary, 19.5% of Industrials and 15.1% of Information Technology. 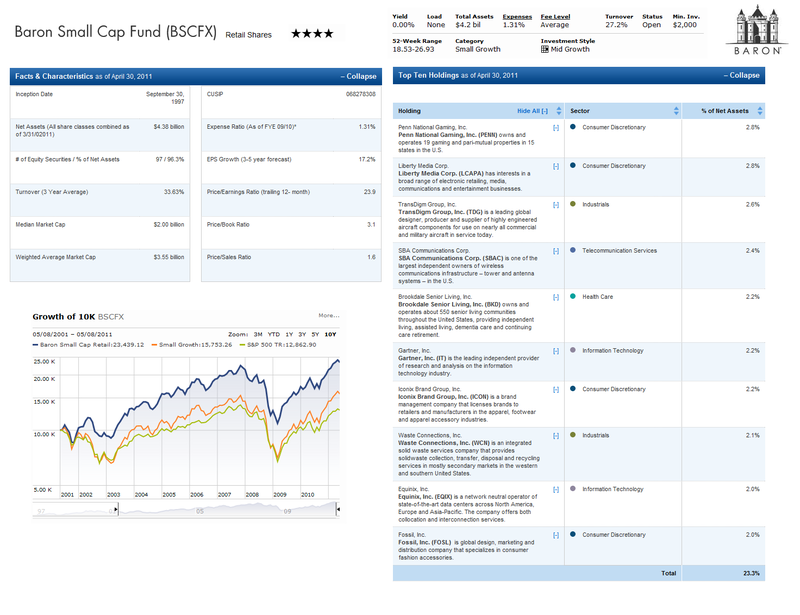 From the latest fund’s semi-annual report, the fund investment consists of companies in the following three categories such as Growth Stocks, Fallen Angels, and Special Situation. More details about other Kiplinger best fund can be found in my Kip 25 Best Fund page.